From the autumn of 1943 to the last days of winter in early 1944, RAF Bomber Command directly assaulted the German capital Berlin. The authors, utilising considerable primary source material piece together the remarkable, yet ultimately tragic stories of some of those lost fighting the Battle of Berlin. The majority of photographs are previously unpublished. ‘Tonight you are going to the Big City. You will have the opportunity to light a fire in the belly of the enemy that will burn his black heart out.' The message from Commander-in-Chief of RAF Bomber Command Sir Arthur Harris was clear. As the Second World War continued into a fifth year, the airmen of Bomber Command were to fly deep into hostile airspace and bring the war direct to the German Nazi capital Berlin. From the autumn of 1943 to the last days of winter in early 1944, during the hours of extended darkness, the bomber crews braved the flak, the searchlights, enemy night fighters and extremes of weather, to bombard the ‘black heart'. Prior to the all-out campaign against the ‘Big City' Sir Arthur Harris firmly believed his bomber force could break the German will to wage war, but he also prophesied that ‘It will cost us between 400 and 500 aircraft'. Fighting High Publishing brings together acclaimed Bomber Command historians to tell the story of some of the thousands of airmen who failed to return from operations as part of the 1943 and 1944 Bomber Command Battle of Berlin. The authors, utilising family archives, personal testimony and records, wartime memoirs, diaries and letters, witness recollections, logbooks, and official documents, piece together the remarkable, yet ultimately tragic events surrounding the losses described. 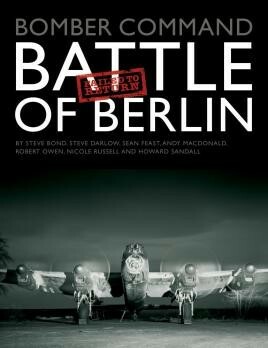 Illustrated throughout with previously unpublished black and white and colour photographs Bomber Command Battle of Berlin Failed to Return ensures the memory of those who made the ultimate sacrifice is kept alive. ‘We Will Remember Them'. The book's crisp layout, superb image reproduction and trademark large format hardback are standard for this publisher. Loss and death are prevalent, and the moody cover reinforces this, but the book gives a voice to the aircrew that can no longer speak for themselves. This book is a valuable addition to any collection of works on the history of Bomber Command. It does not seek to provide a comprehensive history of Bomber Command and nor is it intended to provide a rich source of material for modellers. This book will, however, provide plenty of inspiration to those interested in the subject with its tales of heroism and sacrifice. This book ensures the memory of these boys is kept alive - they gave their tomorrow for our todays. It would be impossible to try and tell the individual stories of over 2,000 individuals, but this book does give a fine insight into what life was like for these men and does help make a fitting memorial for them all. Add the photos and there will be much to interest the reader. A highly recommended read, albeit a somewhat sobering one…This reviewer certainly hopes to see more in what will hopefully be a 'Failed to Return' series by Fighting High - a publisher who always excels in their quality of work. It's a moving read, and the sense of loss is reinforced by the inclusion of a photograph of the grave or memorial of each of them. Superb "Bomber Harris" remains a controversial figure to this day, and Steve Bond's and others' accounts of the Battle of Berlin really don't throw that much light on the man, his motives and his methods, but it's all fascinating stuff and well worth a read.